In this 5 program series of 42 short, narrated, full-motion modules each describing an essential process of cell biology. 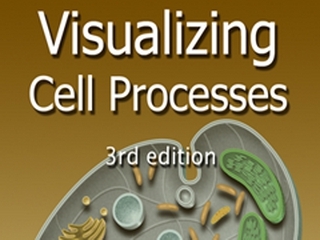 Using microphotography and animation, essential cell processes are presented for easy understanding by students. Cells and Molecules introduces the cell, suggests how modern cells may have evolved, illustrates the elements of organic chemistry, and introduces the topics covered in the Visualizing Cell Processes series. 00:01:41The Cell Machinery: Illustrates cell energy transformations through chloroplasts and mitochondria, the cytoskeleton, and provides a general overview of how cell processes are controlled. 00:01:18This clip describes a variety of cells. 00:03:35Organic Molecules: The program describes biological macromolecules (carbohydrates, fats, proteins, and nucleic acids) and their building blocks. 00:03:43This observational section can be viewed as a time capsule showing what cellular life was like three billion years ago. 00:03:50Independently Living Eukaryotic Cells: Living protists give us a glimpse at how nucleated cells evolved and became the building blocks for multicellular organisms - plants, animals, and fungi. This program explores how independently-living cells move, and illustrates how water, chemical, and nutrient molecules pass through the cellular membrane. Microtubules and motor proteins are explained in-depth. 00:00:55Explore the structure and behavior of the plasma membrane. 00:02:23Osmosis: Explore the net movement of water into and out of a cell. 00:01:05Transport Proteins: Membrane proteins act as gates and channels, allowing substances to enter and leave cells. 00:01:30This clip describes and illustrates Phagocytosis. 00:00:24This clip describes and illustrates Pinocytosis. 00:00:45This clip describes and illustrates Receptor Mediated Endocytosis. 00:00:39Golgi Function: Watch a folded stack of membranes sort and package cell products. 00:02:35This clip describes and illustrates Lysosomes and Digestion. 00:01:12Microtubules: Microtubules create support structures and function in many kinds of cell movement. 00:01:15Cilia: An amazing molecular hook and claw action drives the ciliary beat. 00:01:23Actin and Myosin Motor Proteins: The interaction between these two proteins moves cell particles and produces the contraction of muscles. This illustrates the process of photosynthesis in green plant cells with focus on the chloroplast, then examines the processes of respiration, highlighting chemical activities within a cell's mitochondria. 00:02:43Respiration Modules: Glycolysis and Fermentation: Two ATPs are gained as glucose is broken. 00:01:17The Respiration Module describes Mitochondrion Structure. 00:02:30The Respiration Module describes the Krebs Cycle Animation. 4.) Chapter 4: Electron Transport Chain and ATP Synthesis. 00:00:28The Respiration Module describes the Electron Transport Chain: Proteins on the inner membrane pump hydrogen ions into the inner membrane space, creating conditions for ATP synthesis. 00:01:55The Respiration Module describes ATP Synthesis. 00:01:02The Photosynthesis Module describes Chloroplast Structure. 00:02:30Photosynthesis Modules: The Light-Dependent Reactions: How ATP and NADPH, the energy carriers that drive biosynthesis are produced. 00:01:48Photosynthesis Modules: The Light-Independent Reactions: These reactions create PGAL, the universal building block of sugars and starches. This program uses photomicroscope and motion graphics to illustrate the stages of cell division from the replication of a cell's DNA to cellular fission. 00:01:07Learn about Mitosis showing chromosome condensation. 00:01:56Learn and see the various stages of Mitosis. 00:01:00Meiosis: Chromosome sorting, crossing over and reduction to the haploid number. 00:01:28Learn about the nucleotide structure and means of bonding. 00:01:03Demonstrates that each step in the DNA replication process as a accomplished means of a specialized enzyme. 00:01:54See how DNA replicates the leading and lagging strands. 00:00:39Learn about topoisomerase and the twisting problem within DNA. 00:00:54 A fleet of repair enzymes races over the DNA correcting mutations and replication errors. 00:04:15Review the various aspects of DNA, renegade DNA and viruses. This program uses concise animation to illustrate how a cell's DNA code translates into the protein structure of life, including gene regulation and mutation repair. 00:00:37The Protein Nature of Life: Proteins are the primary structural and enzymatic elements of life. 00:01:09Protein Structure: 20 amino acids produce and almost infinite number of proteins. 00:01:33Shows how the DNA Code is transcribed onto nucleotides of mRNA interaction onto nucleotides of mRNA. 00:01:30Translation and the Protein Synthesis: Describes how ribosomal RNA and transfer RNA interact in the translation of mRNA into a protein. 00:01:46This chapter from the program, The Genetic Code and its Translation, describes gene regulation in prokaryotes. 00:01:23Exons and Introns: One of the great surprises in molecular biology was the discovery that over 90 percent of a cell's DNA is silent. 00:02:46Mutations: Frame-sift mutations are the most damaging, whereas point mutations are a potential source of variety for evolutionary processes. 00:03:28Review the various aspects of DNA, RNA virus and HIV.